Women who find out they are unexpectedly pregnant can be vulnerable. Author Emily Heiden described in a recent Hartford Courant article published on June 29, 2018, being desperate and in despair during an unplanned pregnancy when she happened across a website for a crisis pregnancy center that she later visited. I can relate to the experiences Heiden described during an unplanned pregnancy because I also have experienced an unexpected pregnancy and visited a crisis pregnancy center. I was raised and educated to be a feminist, publicly and vocally pro-choice. My experiences with crisis pregnancy centers have been markedly different from Emily’s description and other Hartford Courant articles that referred to so-called deceptive practices (which included using the color purple on signage as well as the staff’s choice of apparel, practices that don’t seem particularly deceitful to my reading). I have not experienced deception with the multiple crisis pregnancy centers I have visited. When asked if such centers provide abortions, the answer provided was always “no.” I was never forced to view photos or videos like the ones Heiden described, and I presume she must not have experienced force either or she would have pressed charges for being held against her will. 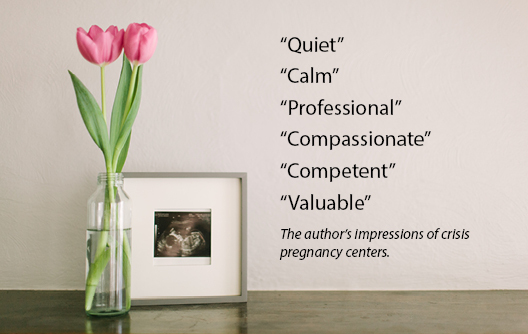 My experiences were of quiet, calm, professional office spaces where pregnancy tests and ultrasounds were performed. I met compassionate staff members, including licensed doctors and nurses, all of whom were women, who competently answered the questions posed to them, and who provided valuable referrals. No information was ever pushed on me. I experienced items such as maternity clothing, diapers, and infant clothing provided to clients without charge. I now describe myself as life affirming and have done a great deal of research to learn more about beginning-of-life and end-of-life issues. Most recently my research has indicated that additional legislation is not necessary because we already have protective laws in place guarding against deception. A Courant editorial published on July 5, 2018, with the headline “There Must Be a Law” said that Connecticut should pass legislation that specifically forbids deceptive practices by crisis pregnancy centers. whether it causes substantial injury to consumers (competitors or other business persons). Because of the existing Connecticut Unfair Trade Practices Act, and particularly the criteria addressing practices that are “immoral, unethical, oppressive, or unscrupulous,” there is no need to pass additional legislation that specifically targets pregnancy centers. Deaconess Tiffany Manor is a member of the LFL Board of Directors and lives in Connecticut. A version of this article originally appeared as an op-ed in the Hartford Courant. Are you facing a dark, confusing time in your life right now? Perhaps you fear you are pregnant or have just learned that you are, indeed, pregnant. Find out more and get help.